Killer Joe is a violent and twisted black comedy with an ending sure to leave any viewer a bit squeamish. Not to mention, opening the Edinburgh International Film Festival with such material was bold move by the festival’s committee. Directed by William Friedkin and adapted by Tracy Letts, from his hit Broadway play of the same title, Killer Joe will leave a harsh impression on the viewer whether positive or negative. Killer Joe tells the story of a young man named Chris Smith (Emile Hirsch). With the mission of collecting his mother’s life insurance policy, he and his father, Ansel Smith (Thomas Haden Church), hire hit-man Killer Joe Cooper to carry out her death. However, Killer Joe’s services come with a steep price: $25,000 in advance. Unable to come up with the cash in time, the father and son agree to trade Chris’ sister Dottie for a sexual advance to cover the front. As the plan takes shape, the story ends in a nasty, trashy and even comedic finale that’ll leave any viewer in awe. 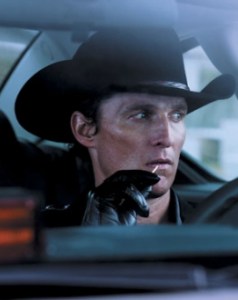 Played by Matthew McConaughey, Killer Joe is a terribly good villain. Every scene the character’s involved in is mounted in tension; by the same token, any scene without his presence lacks excitement. Though none of the other cast members’ performances are poor, they surely are not on the same level as McConaughey. His portrayal of Killer Joe Cooper is definitely a career best; he’s edgy, nasty, excessive, smooth, violent, caring and just an overall badass guy. The last scene, in particular, sums up the character incredibly well. In short, McConaughey steals the show. McConaughey’s work is so dynamic that often time he pulls the best performances from those acting opposite him. Dottie Smith and Sharia Smith’s involvement definitely aid the plot; however, their strongest scenes occur when working off McConaughey. Dottie, played by Juno Temple, is the younger sister of Chris and the daughter of Ansel. The scenes that feature Dottie and Killer Joe are electrifying, yet when featured by herself Dottie lacks that same spark. Then there’s Sharia Smith, the stereotypical crooked wife/stepmom. Gina Gershon steps in the character’s shoes and puts on a good performance, but, yet again, she’s stronger when featured with McConaughey. Kill Joe has potential. The cast and script can testify to that. Unfortunately, the film tends to lose direction. We’re taken on a detour about midway through the film, and led down a path of unnecessary details that simply take away from the feature. At one point, Chris has a juvenile run in with some local gangsters; it’s a scene that has little to no effect on the story. The ending is also incredibly unnecessary. While it’s no Requiem for a Dream, the closing scene will still give you the creeps. But how much is too much? It’s just completely over done, and much of it is for shock value. By the end, I had a strong sense of wanting to forget so much, which is a shame because Killer Joe has the potential to be great. Overall, Killer Joe has its high and low points. McConaughey’s performance is brilliant. Even several of the supporting cast members are able to find their own moments of excellence. Despite the greatness, the excessive and completely unnecessary moments hindered the story’s potential. If you’re in search for a great movie that’ll keep your attention, then skip Killer Joe. You may walk away disappointed; however, it’s not a bad film to simply pass the time. I agree with the review. The movie has some good moments, but also some bad moments to it. It is just an okay movie in quality, with some nice moments here and there.